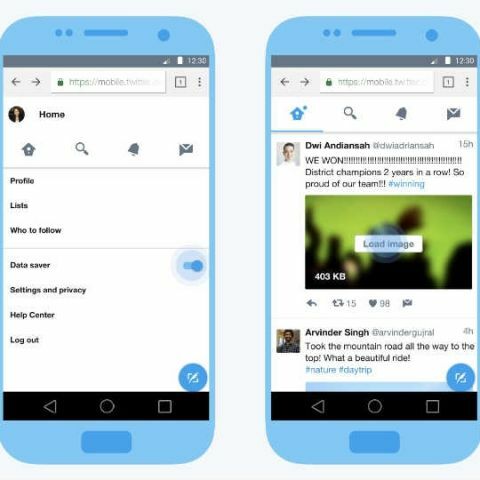 Twitter has announced Twitter Lite, a new progressive web app developed in collaboration with Google.Twitter Lite is designed for emerging markets where mobile is the primary computing device and mobile networks are considerably slower. Twitter Lite follows the recent launch of Skype Lite and other lightweight apps like Facebook Lite. Twitter Lite takes up less than 1MB on user's device, minimises data usage with 30 percent faster load time. Twitter Lite also includes data saver mode and when enabled. Twitter Lite will show preview of images and videos and users can choose which ones to fully load. Twitter says "Data Saver mode can reduce data usage by up to 70 percent, making it more affordable in areas where mobile data is expensive." While Twitter Lite is a low data usage app, it also provides the key features like timeline, tweets, direct messages, notifications, and more. The web app also supports push notifications on modern browsers like Chrome on Android. Android users can add Twitter Lite to their home screen just like its native app. Twitter says "Twitter Lite is network resilient and becomes interactive in under 5 seconds over 3G on most devices. We've optimised images to reduce their impact on data usage by as much as 40 percent as you scroll through a timeline." Twitter Lite is available globally and can be accessed by visiting mobile.twitter.com on your smartphone or tablet. The lite interface will likley become the default web experience going forward.